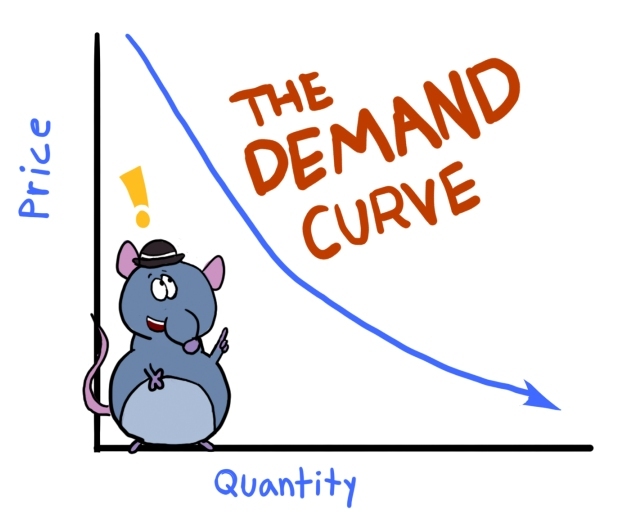 One starting point for understanding economics is that everybody wants stuff. Economists study consumption, or noming. Gustav loves cookies, but first few cookies are really good and after too many cookies they become a bit less appealing. See Decreasing Marginal Utility Graph. Gustav can buy more cookies if the price of cookies is lower. If the price of a cookie is too high, it’s not worth it. He could use his limited amount of lunch money to buy other things (ex. cheesecake). This entry was posted in Demand, Featured. Bookmark the permalink. I beleive that this was a very simple and direct way to present this information. People can also make other simple inferences from this chart. For example, what if he really wanted a cookie but there was one cookie and four other mice? Now we are getting into scarcity and how resources are delegated. The holder of the cookie can auction it and give it to the highest bidder, they could choose from a random drawing, or see who is willing to wait the longest or do the most for it. These are just some of the many ways in which resources are delegated as a result affecting the value of that product. There are many other implications which can be made as well. Really like the chart! Great way of explaining this, although economics is a hard subject for a lot of people and you have to a detail with it you presented the information in such simple form that a person can get the main point clearly.